There’s a long road to travel yet – Where Is My Teaspoon? Tomorrow marks the first day of study month – yes, that means all of my lectures are over already. Where did all that time and money go? Having made out my study timetable..(eek), I decided that a few study snacks wouldn’t go astray either. 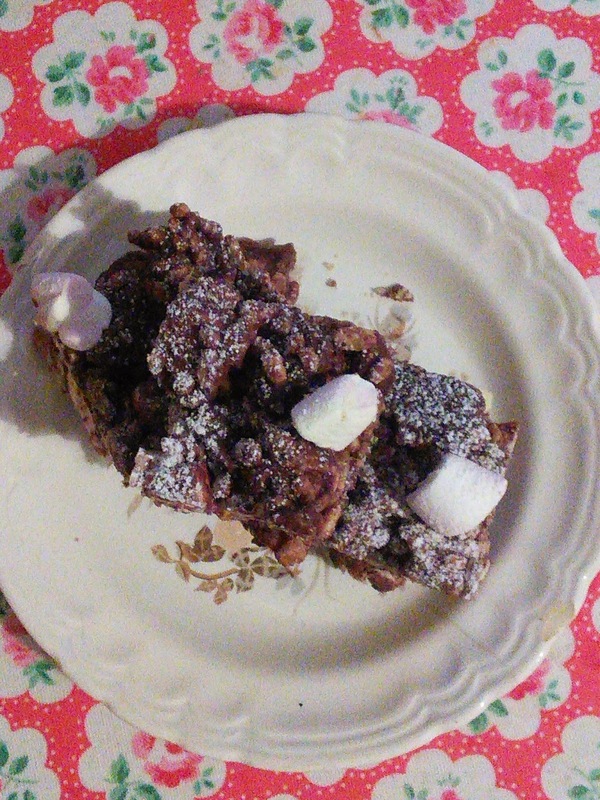 Here is my take on Rocky Road. 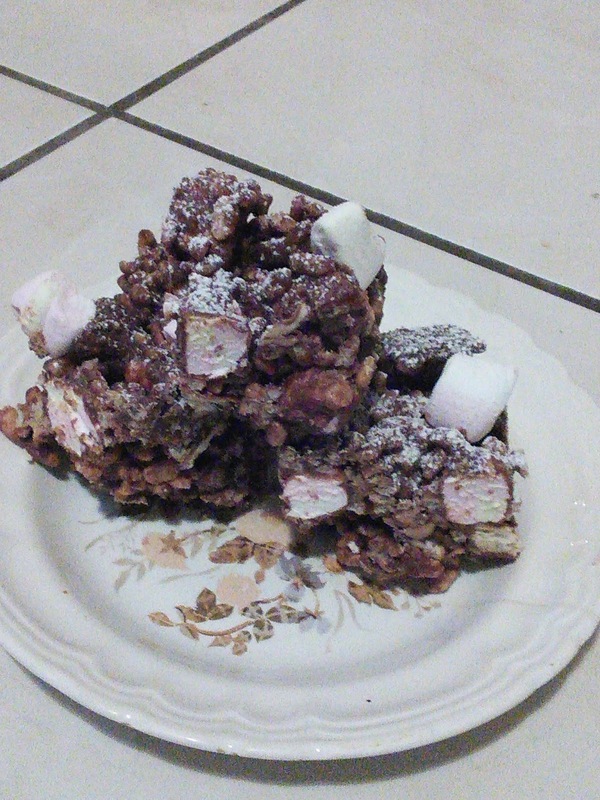 It’s not traditional rocky road though I suppose as I’ve added Rice Krispies, but feel that they’re slightly less fattening than so much biscuit – if you want to leave them out, feel free. This is a perfect recipe to bring along to a party or on a road trip and is brilliant for using up scraps of chocolate and sweets you’ve got left around in your cupboards. Again, I still haven’t got a camera. Mine was sadly too shook to repair so I’m on the hunt for another – if anyone can recommend a good one please do! This actually couldn’t be simpler. Melt your chocolate, syrup and butter together until all is combined. While it’s melting, smash up your biscuits into bite-sized pieces. You don’t want them to be too small or into tiny crumbs. If your marshmallows aren’t mini ones, crop them into small squares. The idea is when someone bites in, they’ll get a bit of everything in one taste so if the marshmallow is too big, it’ll take over. 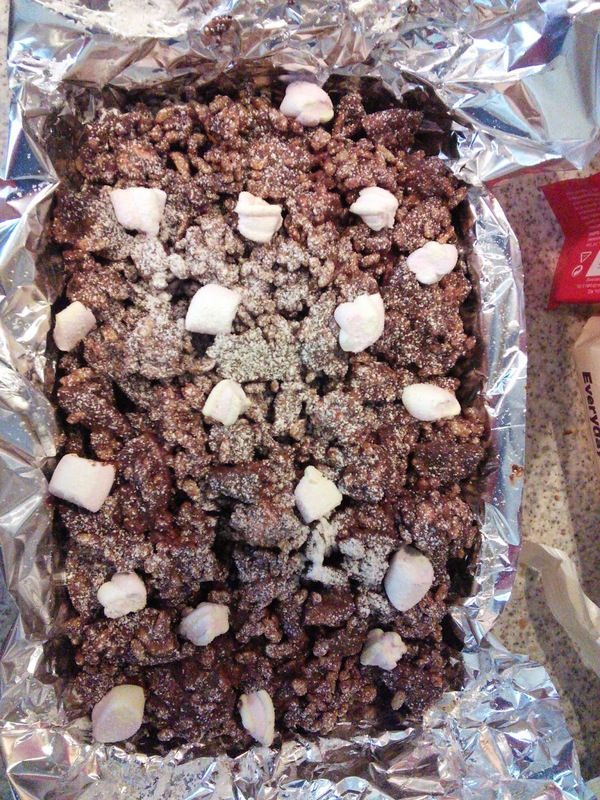 Once the chocolate is melted, add your biscuit pieces, marshmallows and nuts into it and mix. That is basically the whole recipe. You don’t have to stop there though, you could add pieces of honeycomb, cherries or even fizzy candy if you wanted to. Some people like to have more chocolate than biscuit pieces so the ratios are kind of up to yourself. I like mine to have a thin layer of chocolate and loads of filling though so kept adding rice krispies until I was happy. Next Post Won’t you be my sweetiepie?